What is it really like cycling in the suburbs? Before I left Ajax five years ago for Downtown Toronto, I used to bike the Duffins Creek and Waterfront Trails regularly, but was not familiar with other cycling facilities in the area. Having heard good things about cycling in Ajax from various sources and their most recent maps indicating a Minimum Grid in the making – thanks in part to Ajax Mayor Steve Parish being a cyclist - I wanted to learn more first hand. On September 3 I went for a ride to try and determine what the Town of Ajax and Durham region are really doing to improve suburban cycling. To better understand the route my cycling partner Helen Qu and I took you can access information on Duffins Creek here and the Waterfront Trail here. As soon as we arrived at Ajax GO Station we were greeted fourteen racks next to the parking garage. Enough for more than 100 bikes which is an ambitious goal for suburban cycling. While the supply is good, it could be improved by moving the racks inside the garage or be sheltered for protection against the elements. From Ajax GO station we set on our ride. There wasn’t a path available to go straight to Church Street, though it is proposed in Ajax’s official plan. Since the path adjacent to the station wasn’t easy to find, we used Westney Road to get to Bayly Street and the Duffins Creek Trail. The trail along Bayly is paved and some good sized fish (Atlantic salmon?) could be seen from a bridge; hence the presence of people with fishing rods further upstream. 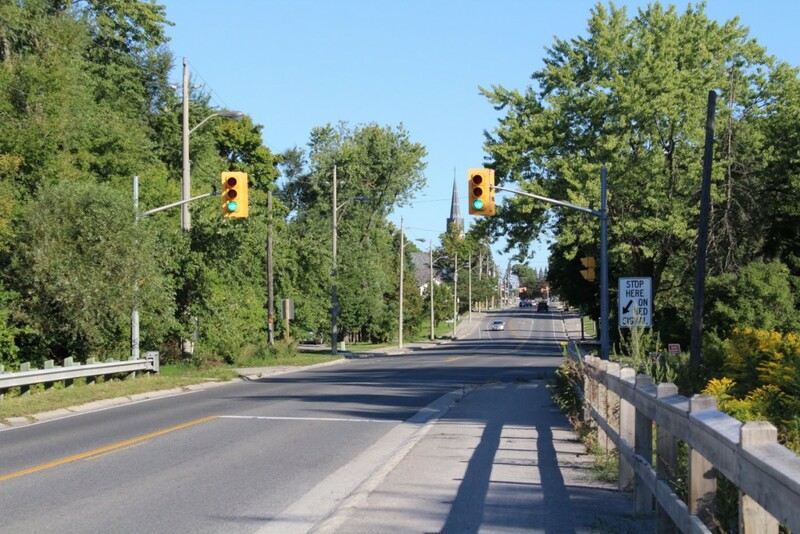 Church is the only continuously safe north-south route crossing Highway 401, while going north provides you the choice of continuing on the trail or using bike lanes on Church to Rossland Avenue. 1 Place the walk buttons on the other side of the poles at Bayly & Church (southeast corner) and Church north of 401 (east side) for easier access. 2 Pave the Duffins Creek Trail to ensure consistency with Ajax’s other trails. The gravel is still passable, but could become problematic after some rain. 3 While there are some wayfinding markers, they should be added at every direction change and branch off to avoid getting lost. Traffic is light where the Duffins Creek Trail ends at the Riverside Golf Course, but bike lanes are planned for installation by next summer. Rossland Avenue is closed for road widening and extending the existing multi-use path west to Pickering. The hydro corridor trail on the other side of Rossland from Riverside is smooth, but abruptly stops at Church, which has a posted 60 km/h limit and no paved shoulders; making cycling to Taunton Road unsafe. The official plan calls for the extension of the hydro corridor and the Church bike lanes to Taunton, but should be accompanied with a traffic signal. An in-boulevard path is provided on Taunton from Church to Audley Road (just before Whitby), which is recommended given the posted 80 km/h limit. Aside from a “Cyclists Dismount” sign under the CPR bridge at Harwood Avenue, it is a surprisingly pleasant ride. When we arrived at Carruthers Creek (just west of Warner Drive), we noticed a new trail had been installed. Providing a safe route all the way to Kingston Road with underpasses at arterial roads. But despite the pros of this path (trail side exercise machine, abundant wildlife etc) wayfinding needs work. The trail ends at Kingston Road, and if you choose to go westbound it requires walking the bike across a grass median and biking one kilometre along a road with a posted 60 km/h limit. With no paved shoulders until the bus rapid transit corridor starts at Salem Road. The BRT corridor is expected to be extended east to just before Carruthers Creek (Galea Road), so a west trail spur to Galea is recommended to close this gap. The BRT corridor goes to Harwood Avenue is expected to go as far west as Rotherglen Road, with two additional segments covering most of Pickering. A small buffer separates the bus and bike lane and feels reasonably safe to ride. 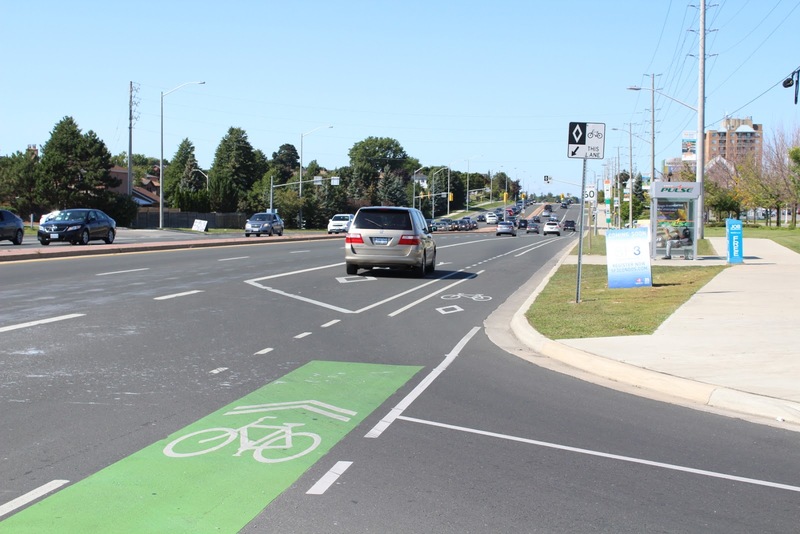 Green paint marks the conflict areas, though indirect left turn boxes used in York Region could have been added at Harwood and other arterials. A multi-use path was provided on Harwood north of Kingston, but no bike lanes were proposed in the official plan from Harwood to Highway 401 due to further study being required. However, bike lanes are proposed south of Highway 401 and the bridge offers 1.2M wide shoulders; thus providing the second safest highway crossing after Church. It should be possible to narrow the traffic lanes to 3.3 metres each and widen the shoulder to the recommended 1.8 metres for a bike lane. 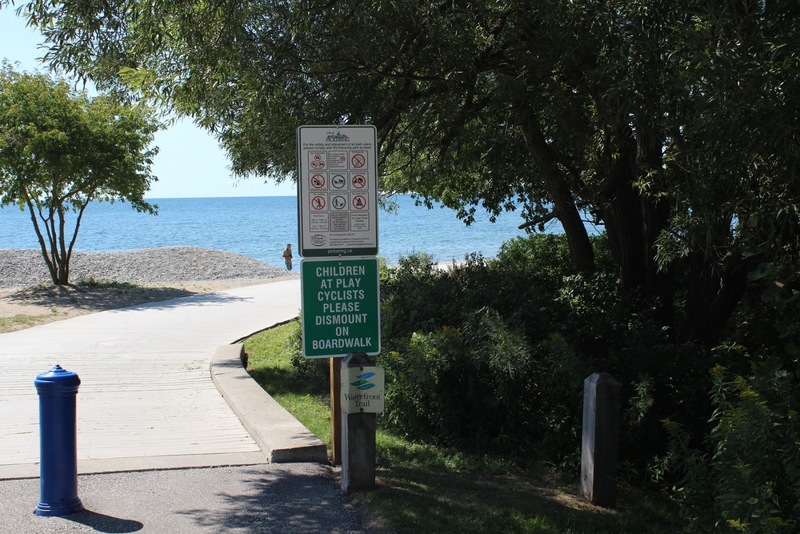 Heading south of the 401, there are boulevard trails on Achilles Road, Salem Road, Bayly Street, and Audley Road that lead to the Waterfront Trail. The official plan calls for cycling facilities on Salem under the 401 (I still prefer Harwood given the highway interchange at Salem) and a bridge linking the two sides of Audley Road in order to make doing a trail loop around Ajax feasible. Once on the Waterfront, wayfinding is good thanks to a continuous line and signage similar to those found on the Duffins Creek Trail. There are plenty of picnic tables available to stop for lunch and the trail surface is mostly smooth. However, two bridges at Carruthers Creek and Duffins Creek have “Cyclists Dismount” signs which should be replaced with “Yield to Pedestrians” signage. Despite these shortcomings, the conditions are considerably worse in Pickering (a.k.a. Durham Region’s cycling laggard). By the time you reach the Pickering Nuclear plant, the trail surface is cracked and switches sides at Brock Road; requiring two signal phases to access. “Cyclists Dismount” signs appear again on several stretches with the most ridiculous placement being along the 500M boardwalk leading to Frenchman’s Bay Marina! If that wasn’t bad enough, the Waterfront Trail dumps cyclists onto Bayly Street for 750 metres to West Shore Community Centre with a posted 60 km/h limit and only a narrow sidewalk available! That sidewalk has to be upgraded to a proper multi-use path as soon as possible given the large numbers of cyclists present. If you’re brave, there are a number of trails and quiet streets that are used to guide cyclists from Pickering all the way to Toronto. Aside from improving wayfinding and filling the gaps (e.g. Riverside, Rossland, Kingston, and highway crossings), intensification is also needed to generate a critical mass for cycling in Ajax. This is already happening in Ajax’s Downtown (Harwood & Bayly) and Uptown (Harwood & Kingston), though single family homes still reign supreme. Not only would these improvements encourage more Ajacians to bike, but also tourism with GO train access and the presence of Ontario By Bike businesses. Despite the improvements that are still needed to make the suburbs more bike friendly - there is hope! My cycling partner Helen noted that as Ajax is relatively flat; two key conditions that have helped make cycling practical in places like Amsterdam and Copenhagen. I would like to thank Bruce MacDonald – DRCC Executive Director – for providing me route suggestions and highlighting some of the region’s cycling concerns. I would also like to thank fellow cycling advocate Helen Qu for joining me on the ride and providing the perspective of someone who hasn’t previously biked in Ajax. The 48 kilometres ride went from Ajax GO station to Rouge Hill GO station.